I have done excavation work up there and noticed your 914 as I drove by. Your going to have great journey. Take lots of pictures. Dont be a dumbass like me, once a month rename the pictures so you can search them at a later date. Bag everything in freezer type bags. I label the bags with blue tape. Not at all! I appreciate the advice. You have me rethinking my sequence as I was going to save the long for last to get the rest of the car as sound as possible first. But it does make sense to hit it first. As I mentioned in my long story, I learned what NOT to do the last time I replaced a long. But my welding skills and patience have improved greatly since then. Do you have details on those braces that work with the door on? What is the lower end mounted to? And do they have turnbuckles built in? I've gone back and forth over whether to start with a rotisserie or build a jig similar to what you did. I see the wisdom in the jig. My challenge is that I can't occupy our one open garage bay with the car more than a weekend or 3 days at a time. So I need to be able to roll it in and out onto the gravel driveway. But now I'm thinking I can build that jig on my castors. Put it on stands when in the garage working on it. Then re-purpose the steel for a rotisserie later. Truth be told, I could probably do this without a rotisserie. But I'd like to flip her up to make sure the belly is done right. Plus they look pretty fun. But for now, I think that jig is making more sense to get here solid and straight. $#@$ you! (IMG:style_emoticons/default/ar15.gif) I hate those warts and deleted them on the last car I painted. I had decided on this one to draw the line at anything that would require cutting or welding to restore to original. But I really do hate those ugly things. Worse, one of my lenses broke, so I would have to spend $ on a part that I hate. On the last car, I also welded and leaded the fender to cowl joint ala the 916 but frankly, didn't think it added much to the appearance so won't be doing that again. IIRC, the Italian cars also had warts, but with clear lenses. Is that correct? Take the tub to Cary for the tub resto.....do the small stuff yourself. Hmmm. The in and out deal really won't work for the long work. You'd be spending more time setting up and re-leveling ............. I'd set the car up outside in a portable awning for working on it this summer. It's light till 11 pm. The rotisserie won't roll on the gravel worth a damn. 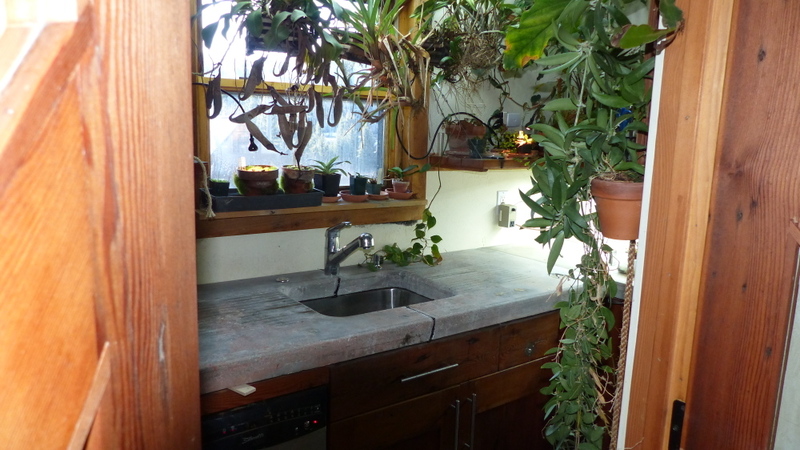 You'll need some sheets of plywood to roll it on. I'll dig around for some door brace pictures. From 25,000 ft. The top is anchored to the upper seat belt bolt. The bottom, I weld a big nut to the side wall. By chance is Kelly Seevers one of your neighbors? He lives up one of those canyons. Old friend from Albertsons. Amazing! Yes he is. Just around the bend. I don't really know him, but neighbors speak highly of the whole family. They are tucked up in "the holler" on Goes Nowhere Road which is aptly named. You'd probably be able to see their house in some of the photos I posted if you cut down the trees. The roller problem is the whole reason I've put this off for so long. Winds can be wicked in this canyon so awnings would have to be built hell for stout. And my MIG is worthless outside because it is rarely calm enough not to blow the shielding gas away. I picked up a set of these casters at HF to handle rolling on gravel. Snooping the Web, it seems others have made these work. I will know soon enough as I plan to pick up tubing for the jig this week. I can leave the car in the garage for the time it takes to complete the long work. I think the rest can go in and out as needed. Worst case, I may have to throw up a temporary shed around he car in the drive. But I'll try this first. Ideally I would wait on this project until I had built another garage/shop. But the longer I let this car sit, the more expensive the project gets. So I will muddle forward as best I can. Forgot about the MIG gas ...................... and the east wind. We built ours with the rotisserie, sorry kind of cheating. Sounds like your on the right track. Maybe I can break away for a couple days this summer and come over and check on you. I spent a lot of time yesterday pouring over those photos on your rustoration thread like a scholar studying the Dead Sea Scrolls. Thought about giving you a hard time about using a rotisserie to build it too (IMG:style_emoticons/default/happy11.gif) I'm going to try to replicate what you did with the addition of the biga$$ tires. You are welcome anytime! Bring Super-In Law! He looks like about the handiest shop tool a guy could have. Maybe we can get Dave out here and make it a party. Made a little progress today. 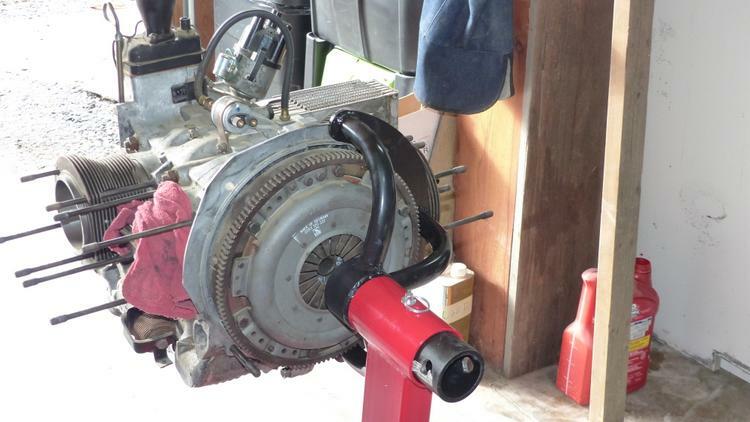 My engine yoke arrived so I hauled my engine out of the shed and mounted it on the stand. 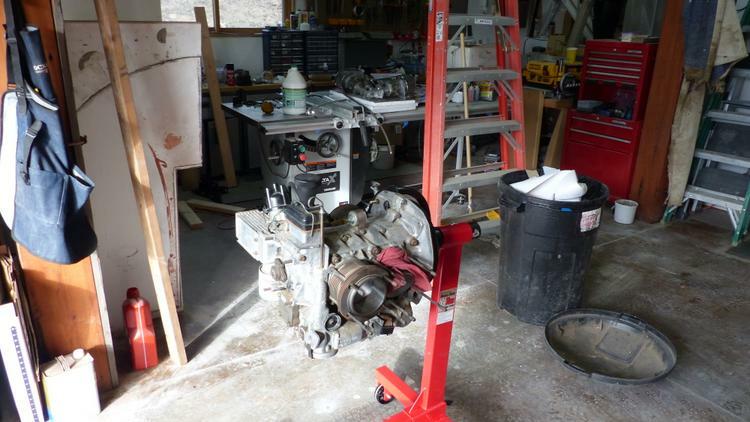 That Mehling oil pump will be coming off and replaced with stock before final assembly. I let some yahoo talk me into it way back when. The 050 dizzy will also go. I paid dearly for it back in the day as they were getting hard to come buy. 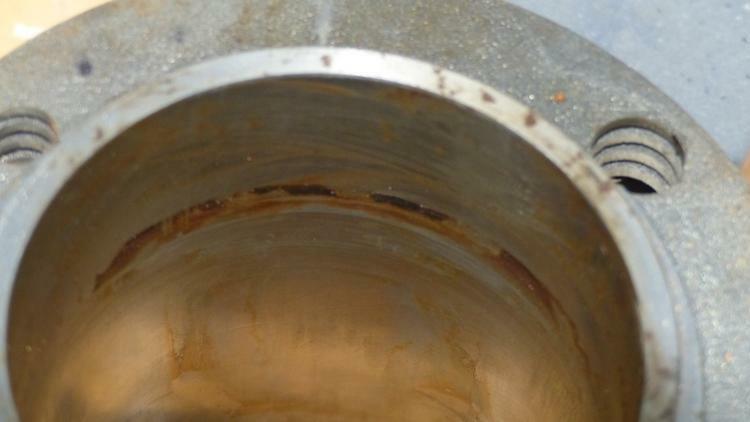 To my horror, one of the cylinders that I had just freed last week and soaked with penetrating oil had already seized again. It took a little coaxing to get that one off. It turned out to be minor but scared the (IMG:style_emoticons/default/post-2-1117899824.gif) out of me. It only took about 15 seconds with a hone to clean it up. You can still see a slight discoloration on this one. Unless someone says this is a problem, I'm going to leave it alone. 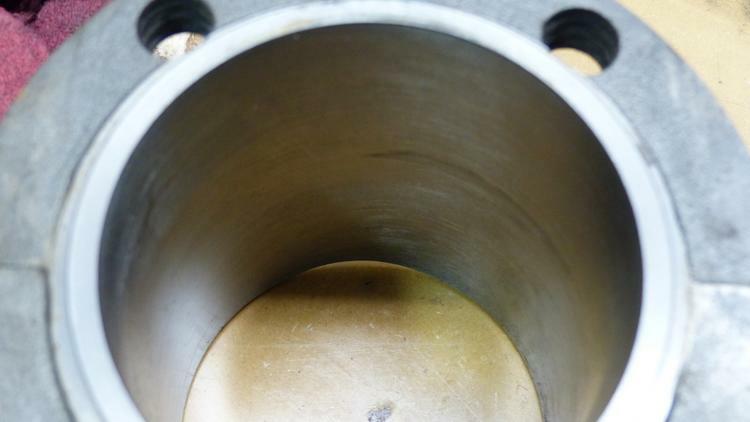 The other cylinders look perfect after a very quick hone. Tomorrow I will give the jugs a hot soapy bath to remove any honing residue and then give them a light coat of motor oil before slipping them back on. While the jugs were off, I made sure all of the piston rings were floating free in their grooves. A few were gummed in and had to be work a bit to get them free. One of the compression rings from the cylinder that was really stuck and took about 45 minutes soaked in PB Blaster and a lot of gentle tapping with a wooden mallet before it popped loose. Once they were all free, I sprayed blaster into all the grooves and worked the rings around until I was sure they were all floating properly. 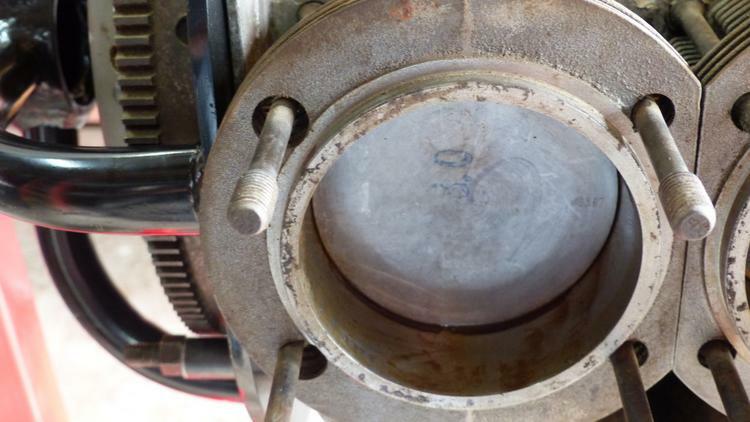 I plan to give the pistons a wash with lacquer thinner before putting the jugs back on to remove any residue and then smear of motor oil unless someone has a better suggestion. I just don't want to leave anything behind that might interfere with the rings seating when I finally fire it up. While things were open, I also peaked inside at the crank and camshafts. Everything looked good except some very minor flash rust on one of the rods. I put a drop of assembly lube on a gloved finger and rubbed it out. I smeared a drop on each side of all of the rods for protection. I also added a drop to each of the wrist pin oil ports while they were available. Finally, I pulled out all the cam followers to make sure there were no issues there and turned the crank a couple revolutions just to make sure things were smooth. Tappet faces, bore and cam lobes were still well protected and lubricated with the assembly lube from when I assembled the case. Once I have the cylinders back on, I'll spray the piston tops with Stabil fogging oil and stuff them with clean rags to hopefully keep them protected. The tectyl I ordered shipped today so I'll spend a few evenings recleaning the case and will brush it with tectyl when it arrives. Then I'll put a bag on the engine and move on to more important things. Should I fill it with oil? I'm just glad I caught the engine in time. Maybe its screams were what prompted me to raise this project from the dead. I think if I'd have waited another year, it would have been a very expensive delay. 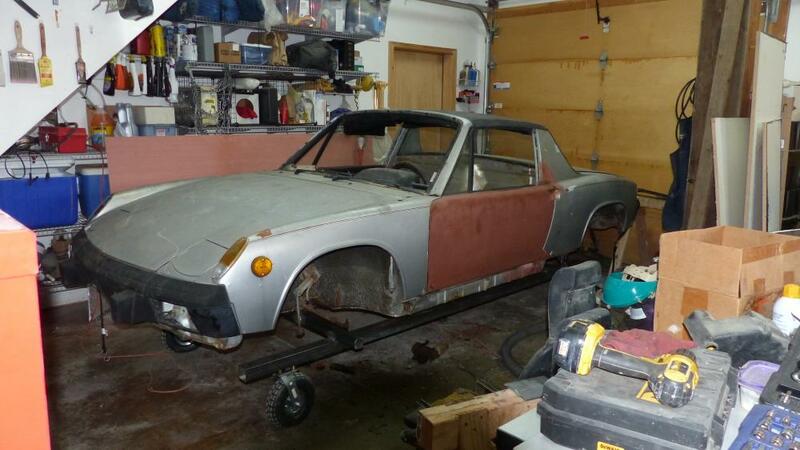 You should decide if you want a restoration project or a 914. 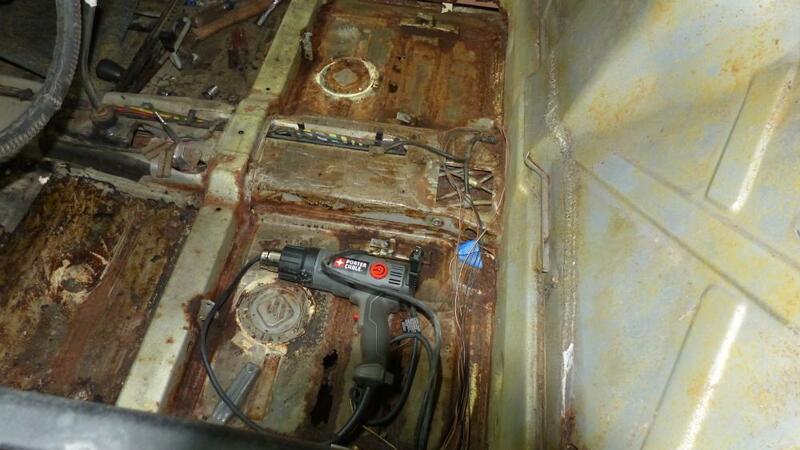 Once you start stripping down the car, you will find that every panel has rust, multiples of what you see now. A rotisserie wont help at this point, the car will bend, even with door braces. 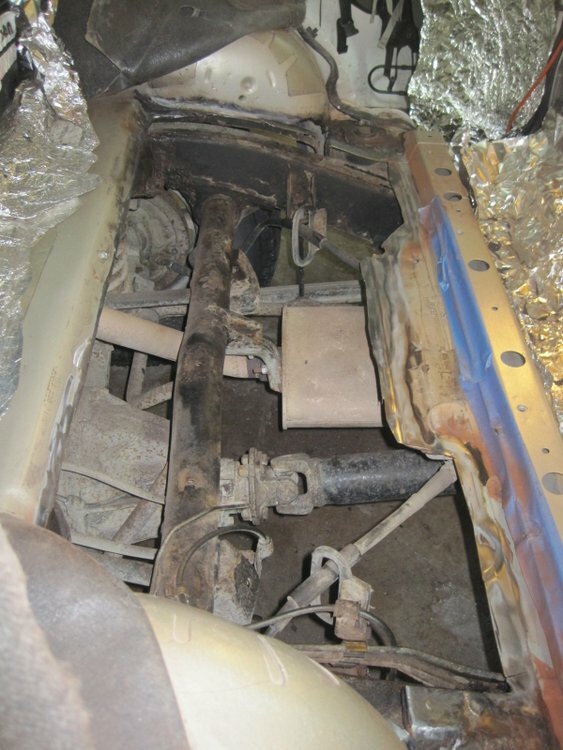 You will spend more money on replacement sheetmetal than you will to buy a nice running 914. And be years ahead. In practical terms you are right but, I understand the emotion involved with this project. It's just the way it has to be done in the owner's mind. I intended to get the car on a roll-around jig over the weekend but Rocky Mountain spring weather and other obligations slowed progress. At least I got the hard part done which was to mount a cross bar to the trailing arm mounts. The will ride on 2" rails supported by 10" pneumatic casters. I had rotisserie envy since this job took half a day and would have gone much quicker with the car upside down and inside the garage where I could weld without taking it off the car. I thought I had some flux core wire but couldn't find it. So I had to bolt the supports to the car. Jack the cross bar into place, and then haul my welder out to the car to make enough crappy tack welds without the benefit of gas to hold the bits together enough to bring it back in the shop to finish the job. But that's the way it goes. Had another issue when I returned from the hour round trip to town to buy some bolts, only to discover that some yahoo had mixed non-metric bolts in the bin so half of what I bought won't work. I'll know to always take a voucher nut with me from now on. After the weather turned bad, I spent some time sorting and reorganizing the various boxes of parts that have been moved and stored for thirty years. My box of NOS had an eclectic array of treasures I had forgotten I had bought. 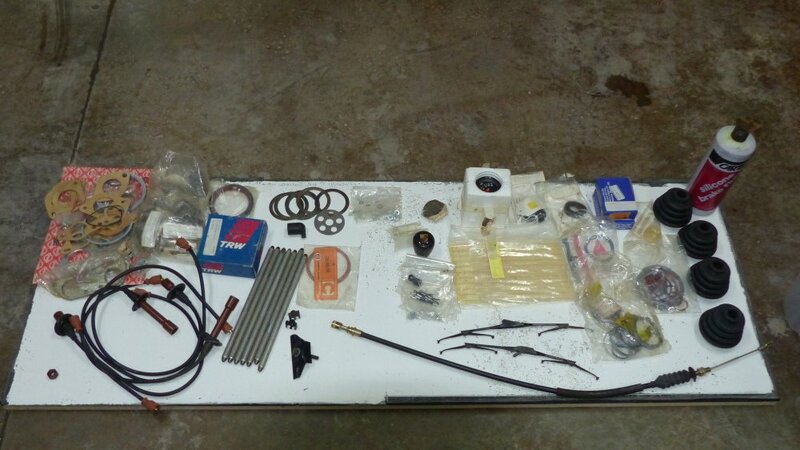 Including: caliper rebuild kits, flywheel shims and crush washers, ebrake cable, ignition wires, rocker hardware CV boots, and more. Some stuff won't be used and will wind up FS in the classifieds. Overall, not a lot of progress; but at least it's progress. Are you gonna be a dental floss tycoon? (IMG:style_emoticons/default/beerchug.gif) Of course! But then again, there are many dental floss tycoons here in Montana. Well, they aren't exactly stock but seem appropriate for the moment. If I were to do this again, I would have put the car on a rotisserie first and then build the dolly jig. It's just near impossible to jack the car up in a way that the jackstands don't interfere with fitment of the jig. Add to that that one of my jack points was rusted out, I was doing it on a gravel driveway, and it wasn't exactly level. Let's just say that the operation was not OSHA approved and took two solid days to finally get the car on the dolly. Just in time too because within hours of wheeling it in the garage, it started to snow - that's spring in Montana for you. The 10 inch pneumatic tires work reasonably well on our gravel driveway. My wife and I were able to wheel it into the garage without too much trouble. But the pneumatic tires add a lot of rolling resistance and having swivel casters on all four corners makes steering a bear. I think I'll swap the tires our for solid core rubber wheels and see if that helps. I might replace the rear swivels with fixed casters but haven't decided yet. 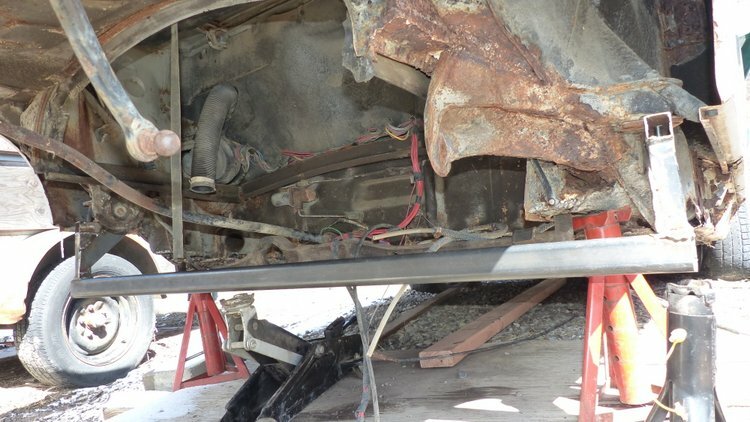 Just having the car on the dolly makes it look a lot better and I was able to continue with what was left of stripping to the chassis and make a better assessment of the condition of the sheet metal. 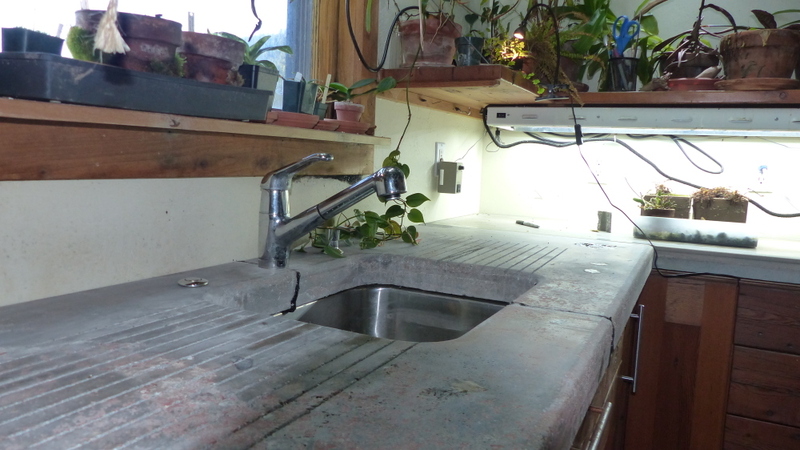 It looks like about $1,100 of RD panels plus a lot of fabricated patches will get the job done. But I'm hoping to sore at least a few panels from donor cars but so far, no luck on that. I got most of the tar off the interior floor. The rear section is toast and will need to be replaced. 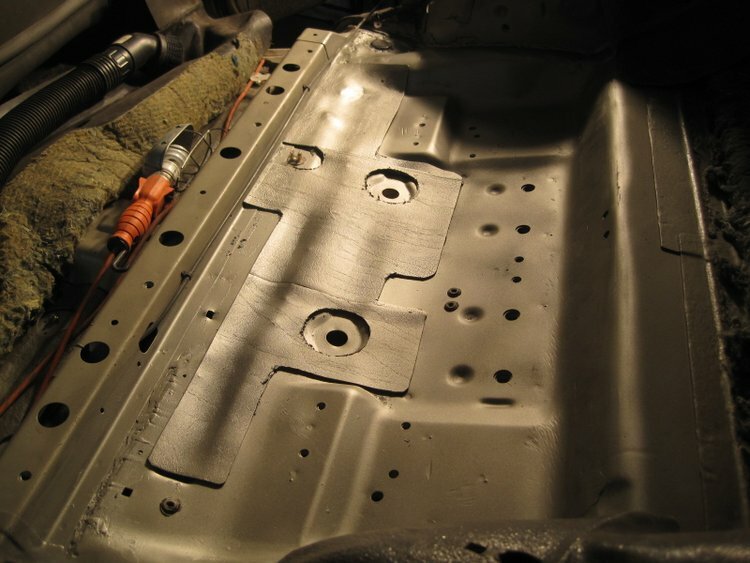 The bottoms of both inner longs are badly rusted but can be patches with sheet metal. 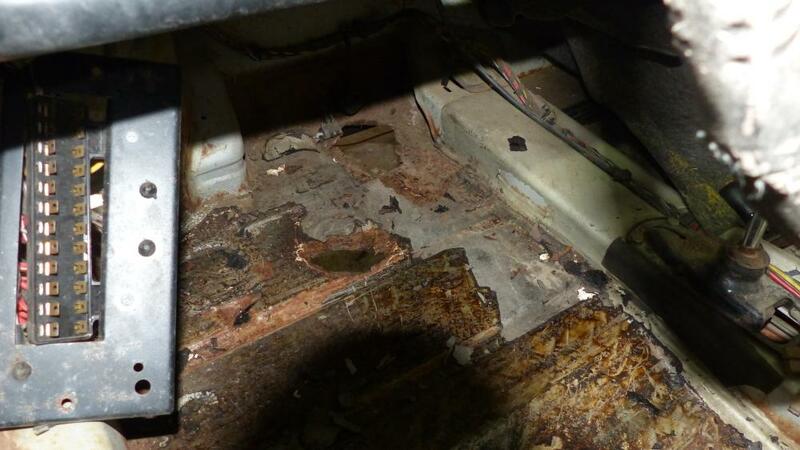 The outer flanges of the front floor panels where they attach to the longs are rusted in spots but can be patched. If money were no object, I'd replace the front floor with the RD panel but money is always an object. The two large holes under the pedal cluster that were a major reason the car was mothballed to begin with, did not repair themselves in the thirty years since, so those also need patched. The left outer long is in pretty good shape. I had forgotten that I had patched that long and replaced the jack pyramid and tube and those look good. There is a small patch needed on that long but thanks to the rusted out bottom of the inner, I was able to get a pretty good look inside and don't see anything major over surface rust. I did a lot of stabbing with a screw driver to make sure it was sound. Moving to the hell hole. Thing were not too bad. The console replacement I did when I first got the car has held up pretty well. I didn't get the rust stabilized as well as I should have, so there are some minor spots to patch but nothing major other than the right long which wasn't touched int he earlier repair. The engine tray is still pretty solid with a few minor spots to be patched, and I need to replace the engine seal track bead. The battery tray is toast. The support is still sound but will need to be removed to access other spots to patch. The left outer roof pillar needs some minor repair and the right needs major repair. There is about 1/4 inch of bondo and a bunch of "California rivets" on the right quarter panel and pillar so there is almost certainly some metalwork to be done there. And there are lots of small patches in door corners etc. that need to be done. 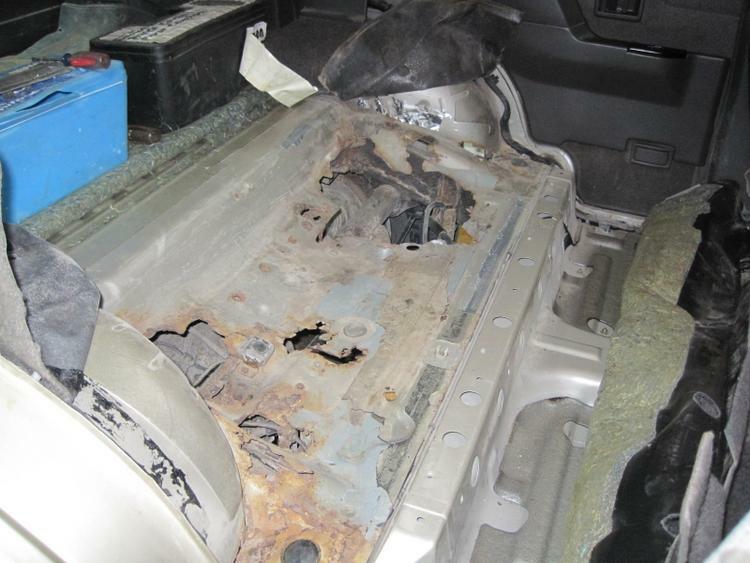 On the ends, the front trunk floor and rear section of rear trunk floor need replaced. There's a good change the rear trunk lid will get replaced but I'd like fail at hammer forming a patch there first. It seems like a low risk skill builder. It's a big project ahead. There will be surprises, but the sheet metal bill is about what I was expecting and doesn't seem horribly out of line. Last Friday I upgraded the gas bottle size for my welder and finally got a cart for the rig. I also made an offer on a 60 gal., 6.5 HP air compressor from Craigslist this morning to replace the one I sold with the house when I moved. Still waiting to hear if I was able to snag it. I hope so because I don't think I can do this without good air. I love your story and the picture of you and your wife from the 80s I was married around then as well. I do not want to come off as rude but I was born in California and lived here my whole life and have had a number of 914s from my 25th birthday on. I have bought and sold cars over the years and mostly rust free cars have spoiled me. I think you should see if you could get a roller from a dry state and get it delivered to you. I think you will be ahead of the game. If you do not get a full car look for parts like hoods and doors. I know that I have an old hood and doors with little to no rust. Bruce Stone here can help you get good body parts if you need. 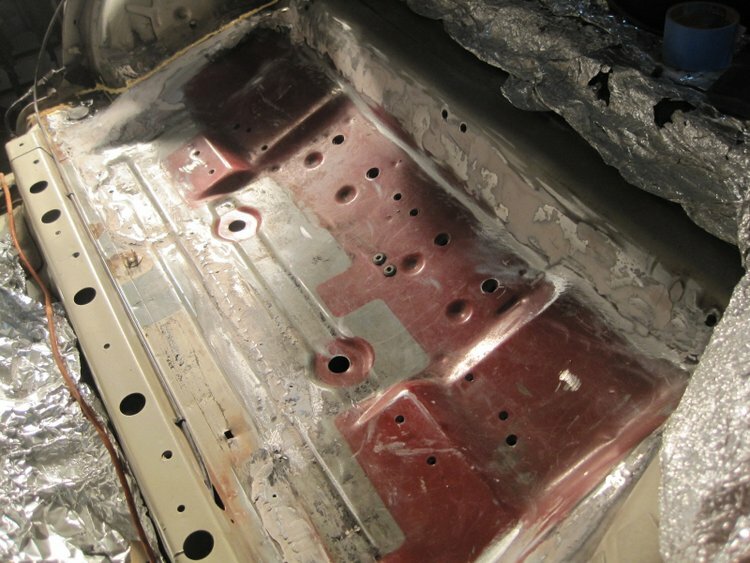 Patching panels may save one more 914 but there are still a lot of them. You could get a pallet of parts sent to you from California. “California knows how to party” I was a huge Frank Zappa fan. It should not cost you that much if you combine a bunch of parts. See what you can find as a roller. I paid $3,500 for a primo roller from Palm Springs that had been repainted really well and had a fresh interior in real leather. Radio, lots of great stuff. New windshield ECT. Carpet. I got the car in my Avatar from Camp914 and he had it delivered to me for $500. This will all add up plus your time to do all of the work. There will still be plenty to do and you will be on the road much faster if you find the right roller. A fixed rusted car in my option is not as good as an original car. It would take so much more work to fix the rust that you do not see. The sail panels in side are crying. Lots of body panels inside that you cannot see are crying. The problem is if you do not get it all it comes back to haunt you. The perfect paint job 5 years later gets bubbles in it in some areas. I had a 70 Challenger convertible that I bought in 1983. Looked premo. $3,000. back then. It was Hemi orange, fresh paint. Bought it at a car show in Pomona from 2 guys that brought it down from Canada. Sold it 5 years later for $4,000 after the rust started to creep back through the rockers. One mans option. But one man that loves these cars as well as you do and as a businessman I look it all over. Welcome to the board. Great guys and lots of knowledge. I hope I am not out of line.